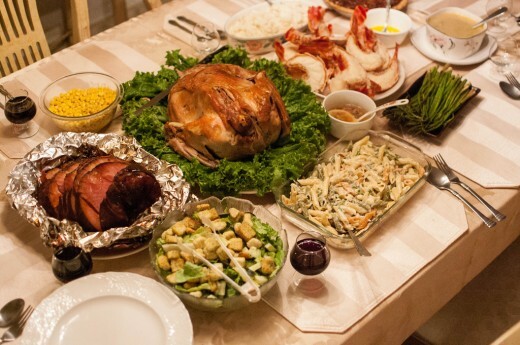 Leave it to the United States of America to celebrate a national holiday where we can take time off school, work and other duties to overindulge on delicious homemade meals, watch the cousins battle it out over the last slice of pumpkin pie and cringe as drunk uncle number three regurgitates turkey on the patio. This is pretty much a holiday dedicated to binging and we embrace it with open arms! ‘MURRICA! Although it’s ultimately fruitless to frown upon these hedonistic pleasures, for the record, we were slightly appalled to find out that people actually slow cook Turducken for Thanksgiving dinner. In case you’re wondering, Turducken is a deboned chicken stuffed into a deboned duck, which is then squeezed into a deboned turkey. If you eat it, you will feel not only feel stuffed, but ashamed, and you may proceed to drown yourself in tears and apple cider. Here’s a playlist to get you drooling and jiving (yes, simultaneously). It features some excellent artists who have written songs with scrumptious titles. Bon appetit!